One of the key differences between geology and most other science is that later workers can see the exact same “experiment” as the original workers. In other fields, replication is the standard; while you cannot see the original experiment, you should be able to reproduce it. For us in geology, though, we can usually see the exact features interpreted before. 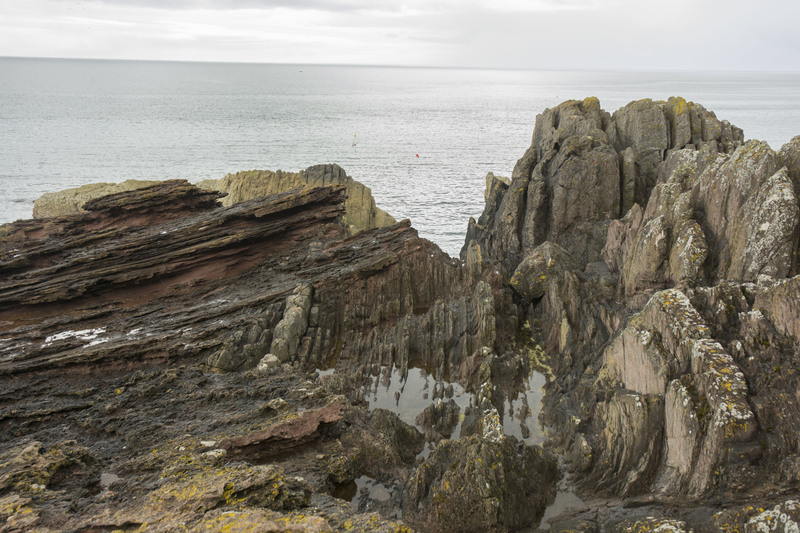 The “Classic” view of Siccar Point with the angular unconformity between the Late Devonian Old Red Sandstone (dipping gently to the left) and the underlying Silurian turbidites (vertical beds at right). CH Jones July 2015. Texts often trim away that righthand side and sometimes zoom in even closer to the unconformity. But if you come to visit, that righthand side stands out: those Silurian graywackes are rising up above the unconformity. Keep that in mind; we’ll come back to it. Ars Technica has an interesting piece from a science reporter who attended a climate skeptics’ conference. The whole thing is worth a read to see what passes for scientific insight from that sector of the populace. Most depressing is the enthusiastic participation of the chair of the House Committee on Science, Space and Technology. And while we’re wallowing in bad (or even non-) science, you can go see the rather uncritical piece that CNN put together on a very shaky study claiming that the Sun is about to drop Earth into a deep freeze. Rebuttals to this are slowly filtering in, but this is a reminder of a long-standing wish on the part of some astronomers that astronomical events dominate earth’s history (see Nemesis hypothesis, gamma-ray bursts and extinction, paleoclimate as solar activity indicator like Willie Soon’s work–GG recalls some older things with patterns in orbiting through the galactic arms, etc.). While the Sun is certainly an important player in climate and you don’t discount its effects without some checking, such short-timeframe variations seem to have a limited climatic impact (Soon’s work, for instance, has been reexamined by many, and studies have also been done for a repeat of the Maunder Minimum of Little Ice Age fame). Now to be fair, the research is really aimed at predicting the intensity of solar sunspot cycles based on a principal component analysis of three solar cycles; without understanding the physics underneath fully, it is basically advanced pattern matching. It is offering a starting point for possible theories on multiple levels of convection in the Sun (the double dynamo alluded to in the press release). The connection to climate that the media latched on to is based on the speculation that the previous such minimum in solar activity occurred during the Little Ice Age, a speculation that has not been well supported. 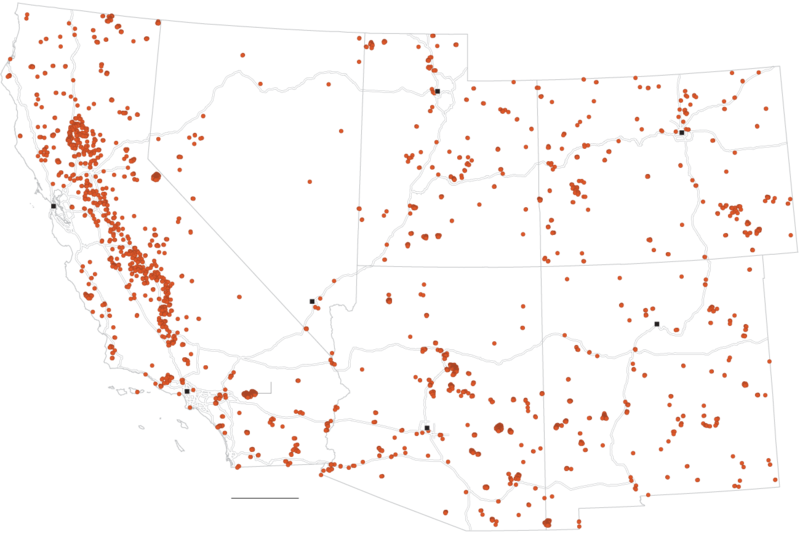 Yes, you see that big swath of red dots across California and it should be, it must be, loads of forest fires! The mountains are just one big bonfire! Wildfires everywhere! Um, are we seeing things? Are those dots…in the valley? In fact, a sharp eyed reader might note that SR 99 is shown on the Times map on the east side of nearly all these fires. And if you have driven in California, you know that between 99 and I-5 (which is more obvious on the map) is farmland. Very flat farmland. What is going on is the typical action of farmers preparing fields and clearing canals in winter and early spring: they set controlled fires. Most of these are not wildfires. The maps the Times made is largely made up of intentional agricultural fires (you can see the same thing northeast of Denver). And had any clever soul in their graphics department compared the map with land use, they might have seen that this was the case. So, once again, thanks, New York Times, for sharing your sense that the geographic realities of the west don’t matter and so preparing material utterly beside the point you are trying to make! In a perfect world, variations in representation of ethnic minorities in different fields would carry no significance. In such a world, the near absence of black faces in the American geoscience community would be just a statistical fluke. Now, African-Americans are underrepresented in many parts of American society, but geoscience is spectacular. Only 8.1% of American graduate students in science and engineering identify as African-American, which is depressingly below the 14.9% of Americans in that age group who are black, but focus in on earth science and the number is 1.9% (data from NSF). The only fields lower than earth science? Ocean science is at 1%, ecology and astronomy at 0.9% and zoology at 1.1% (nuclear engineering is also low at 1.6%). In all of the other fields, the difference could be attributed to rounding errors as the numbers of black students in those fields is well under 100 and total number of students is under 3000, but the number for earth science is depressingly low and much more robust. When we look through graduate applications, we are always struck at the absence of African-Americans. At Boulder, in an average year, there are between one and none who apply. We like to attribute this to broad issues in society, like the generally lower number of well-prepared minority students and the lousy way earth science is taught in K-12 schools. And Boulder is a pretty lily-white place anyways, so we don’t have a strong feeder system. But there is something else at work here, and those other fields provide a clue. Being an American in Europe is a reminder of how unrefined and ignorant Americans can be. No, we don’t speak three languages fluently, know which clothes to wear to the opera, or know why Belgians like to tweak the French. We find 100 year old buildings historic (50 year old in Boulder! ); Europeans view them as modernization efforts. So probably the biggest insult you could hurl at Europeans is that they are naive. So GG has been here in Europe, very near Germany (and France, for that matter) and watched as opinions are expressed on the crisis in Greece. And the conclusion is that there is a lot of naiveté going around, and so it feels like a moment to turn way off-topic. The retort is, well, never very happy, but stuff like that happens all the time. Krugman points out a specific example of exactly that. Those of us in the western U.S. are familiar with the rural parts of states getting angry over some laws or regulations passed by urban interests over their objections. These areas then routinely plot out ways to secede and become new states until somebody finally does the math and recognizes that they can’t afford to be without the urban areas, which are paying more than their share for roads and schools and other services in rural areas. Do the urban areas gleefully look to jettison the rural ones? No. The same thing happens at state levels, where many states get more than they pay to the federal government, yet we don’t drop a few stars from the American flag over it. And you know what? If you share a common currency, this is almost a necessity. It is the difference between the American union and the European Union, and that a German economist is oblivious to this is, well, a fine demonstration of naiveté.